This easy recipe, created by Rebekah McCaul of Alexandrina Cheese Company, is perfect for a sunny autumn lunch or a special cheesy treat at your next dinner party. We are lucky enough to share it with you on Eat Local SA ahead of publication in a new book, Faces and Food of the Fleurieu in Spring 2018. To make the baste, mix together the olive oil, honey, soy and seasoning – you can make this ahead too, just keep it chilled. For the dipping sauce, mix all ingredients thoroughly. Preheat a non-stick pan, or your barbecue or grill. Stir the basting liquid to combine all ingredients thoroughly, then brush the kebabs with the baste. 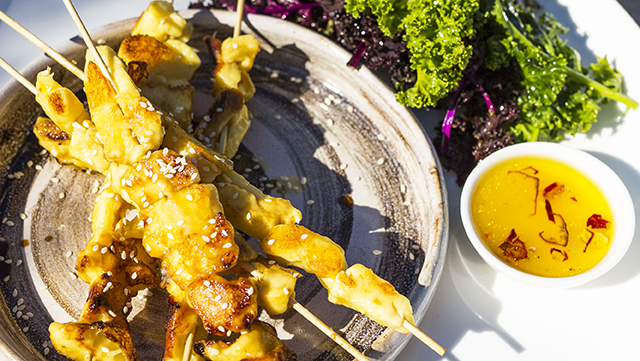 Cook the kebabs for 1-2 minutes, turning often, until the cheese begins to turn golden and are just tender. Serve while still hot with bitter greens and dipping sauce.